National Restoration Parts | Information on car Classic and Muscle Car restoration parts, installs, tips. Finally… the Edelbrock E-Force Supercharger system is not just a performance upgrade, it also has great looks! 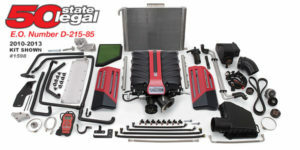 The supercharger assembly and aluminum coil covers (on most applications) are powder coated for durability and provide a unique appearance that will give any engine compartment a custom look. With so many reproduction options on the market, knowing exactly what you need to repair or replace your sheet metal will save time and money! Learn the difference between fulls, skins and patch panels. Get it right the first time. Full Quarter Panel is made just like the panels that are welded to your car when it was first produced. These panels reach all the way to each edge of the rear quarter panel area, including the trunk and door edges, and reach to the roof line. just like the factory-original panels did for your particular model. For Dodges and Plymouth, the door jamb was never part of the original quarter panels. Quarter Skins are nearly as large as “Full Quarter Panels”, but do not include any trunk lips or said panel. 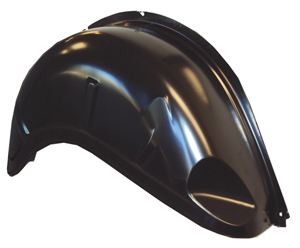 They cover only the side of the quarter panel, and reach upward to approximately the location where the bottom of original vinyl roofs would normally be. Keep in mind that while “Quarter Skins” initially cost less than “Full Quarter panels”, it often takes more labor to install them. So if keeping your costs down is the only reason that you might select “Quarter Skins” over “Full Quarter Panels” you should be aware that the final net cost might not represent much of a savings. Also, “Quarter Skins” do require a lip to weld to – all the way around the edge. This makes them a poor choice for badly rusted out cars or collision damage, since there is often no bottom edge remaining to weld to. In this case, you are better off choosing “Full Quarter Panels” and adding outer wheel houses to complete replace the rust. Quarter Patches are just what they sound like. Small pieces of quarter panels for repairing small holes in isolated areas. These are good choices for nearly perfect cars with tiny holes in specific spots or for low-budget “driver” cars. Yet it can be very difficult to hide the seam areas where the patches are welded to the original panels. 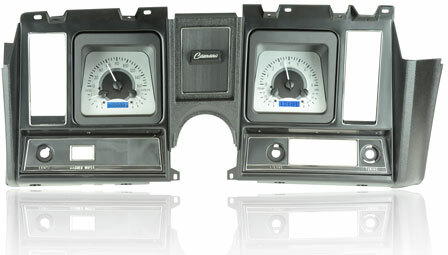 Welcome to DynacornBodies.com your source your replacement classic body shells restoring classic cars such as Camaro, Mustang, Firebird, Chevelle and even a Chevy Truck! Each body is inspected and worked on by hand Increased amounts of CO2 have been used during welding that tightens the tolerances and helps to reduce road noise. 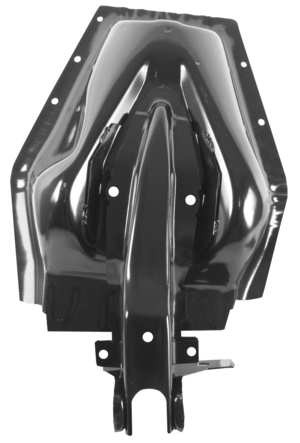 All replacement parts have been increased in thickness to accommodate a stiffer better replacement body shell. Increased thickness, better tolerances, use of more CO2 in welding gives you a product that is unequaled in the restoration parts industry. The steel possesses fewer additives allowing it to be a bit more flexible and workable than the original. We appreciate classic Mustangs just as much as the next person, but they did come with their fair share of annoying and sometimes dangerous design flaws, such as cowl vents that leak, seatbacks that easily brake, dangerous braking system defects, defroster air doors that fall apart over time, parking brake mechanisms that too be honest never worked well, door latches that froze, and shock towers that cracked. Cracked shock towers are not only hard on front-end alignment, but also dangerous, a crack can turn into a highly dangerous shock tower problem and complete steering system failure. To understand why Mustang shock towers crack, you have to know a little about Mustang suspension systems themselves and how they were designed. The classic 1965-73 Mustangs have a coilover upper control arm front suspension system. By using this design Ford was able to save some money which brought the overall cost of the car down but, it was not a good design in terms of strength, reliability, and overall handling. The Mustang also had another serious design flaw, the upper control arm binding and having to handle unwanted slack. If the upper control arms bind, the shock towers flex with suspension articulation, this causes metal fatigue and can lead to cracking. The 1967-70 Mustangs have the same basic shock tower, they are different in how they connect with the rest of the body. This means a different center apron and different part numbers. Dynacorn has created a shock tower different from original equipment; is its heavier-than-original gauge steel construction, which makes it even stronger than the factory factory specs. The shock tower cracking seems to me mainly focused on the 1967-70s models so anyone with this car or in the process of doing a Mustang restoration might want to inspect your shock towers very carefully. Anyone looking to put serious power down on their Mustang might want to take a look at the new 2″ wider wheelhouse / wheel tubs from Goodmark. These wheelhouses will fit a 1964-70 Ford Mustang or Cougar and add a extra 2 inches in order to fit a larger tire such as a 295/35/18. These wheel tubs need to be welded in and we highly recommend having a experience body shop handle the install. 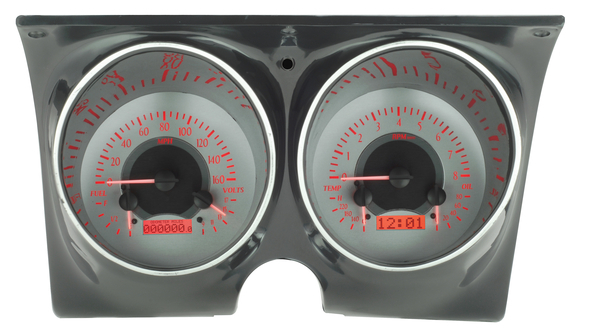 You can also browse all the Mustang restoration parts for everything you need to finish your project! Shopping for new custom wheels for your car or truck is not an easy task. First you have to decide from thousands of different sizes and styles and that can be down right mind boggling to say the least. So let’s simplify things about and answer a few questions okay. The first question to ask yourself is what is my budget? This will determine many things such as do I need to stick with the stock size since going bigger means I need new tires as well. Can I afford chrome or do I need to stick with painted or polished aluminum or even steel? Chrome wheels are generally much more in case anyone is wondering. Once you have figured out your budget it is time to move on to the finish. What kind of finish do I want. If your budget is on the lesser side this will rule out chrome, however it does not rule out polished aluminum as an alternative. Just remember polished aluminum is much more maintenance however with the proper polishes and tools and a high speed drill this can be fairly easy to accomplish when needed. If you have chosen a painted or powder coated rim then remember you want to protect them. Painted wheels should be waxed on occasion to help give them a barrier from brake dust etc.. Another thing you will want to do with painted wheels is keep them clean. If brake dust sets on them they will develop the nasty rust spots that will not come out. Now that you have learned a little bit about the finishes it is time to move onto the next step. By now you should know your budget and hopefully what size you need. You should also have an idea on what finish you want and what color. So you have narrowed your selection down to a certain size, finish and color. Now you must find the right style that has the correct offset for your vehicle. This is best determined by your rim dealer but here is a brief explanation off offset. A front wheel drive car has a positive offset meaning that the face of the wheel is toward the outside edge. An older rear wheel drive car or truck has a negative offset meaning the face of the wheel is in deeper many times a zero offset meaning the mounting surface is exactly halfway. A modern SUV or truck usually has a mid offset which is more on the positive side such as plus 30 offset compared to a car which may have a plus 38 offset. The numbers are in millimeters by the way.